I recently decided to augment my analog chain by adding a stereo tape simulator to the mix. Those who know me know I am a huge fan of Rupert Neve Designs. After all I have a RND Master Buss Processor and I absolutely love it. RND makes a Portico 5042 tape simulator that actually uses a magnetic tape head. The thought of adding something with a magnetic tape head in to my chain wasn’t an attractive option to me. Mainly because of the potential noise it would add in use with some of my other analog equipment. A quick Google search reveals that others have had the same issue with the RND tape simulator. Also there are only two simulated tape speeds with the RND device, which I find slightly limiting. I could have also went with an Empirical Labs EL7 Fatso. The Fatso is a pretty neat device but I was actually looking for something a little different. I wanted to build something this time around. After all I can’t have my soldering skills going in the toilet. Then I found the Sound Skulptor STS. The STS was relatively inexpensive compared to some of the other devices, that is if you decided to build it yourself. 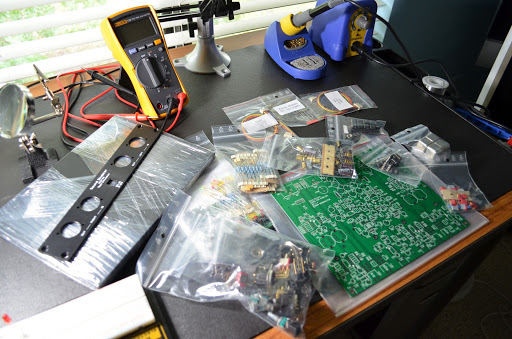 Now, I have a little bit of an electronics background but I am far from being an expert. All in all I considered this build fairly straightforward build. If I had to rank the build difficulty on a scale of 1 to 10 I’d probably rank it at a 3 or 4. All of the components and instructions were included in the kit. What do you really need to know about electronics? First and most obvious is you are going to need to know how to solder. Soldering both standard as well as surface mount components is necessary during this build. You are also going to need a basic understanding of electronic components. You need to know what they look like as well as a general idea of their function. Even though it’s not an overly difficult build if you don’t know the difference between a capacitor and a resistor then you should probably not attempt it. For example if you put an electrolytic capacitor in backwards it will explode. 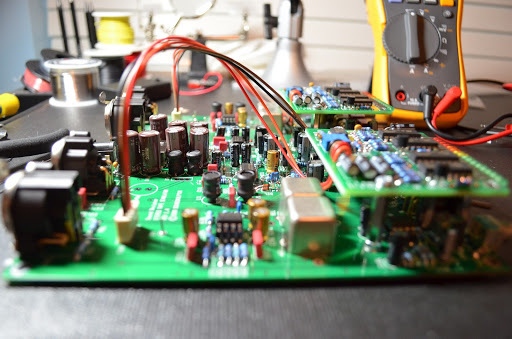 A multimeter is also necessary so you are going to need to understand the basic functions of the multimeter as well as how to take measurements with it. Most important is you are going to need to know how to follow directions. The build instructions are very logical having you install the shortest components closest to the surface of the PCB first. 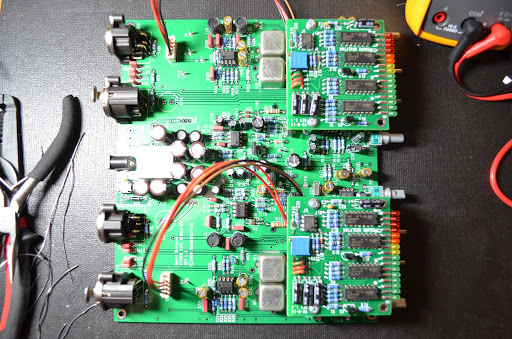 The build documents contain directions, schematics, and a layout sheet for the main PCB as well as the LED PCBs. I can’t stress the importance of having a decent soldering iron enough, especially one with a decent chisel tip. There are several ICs that you have to solder directly to the board without a socket. ICs are sensitive to heat so not getting them too hot is extremely important. I kept my soldering iron at about 350 degrees throughout the whole build which seemed to be the best for all components needed for the build. I recently purchased a Hakko Solder Station FX-888 and I absolutely love it. It comes with a small chisel tip that is great for electronic work. 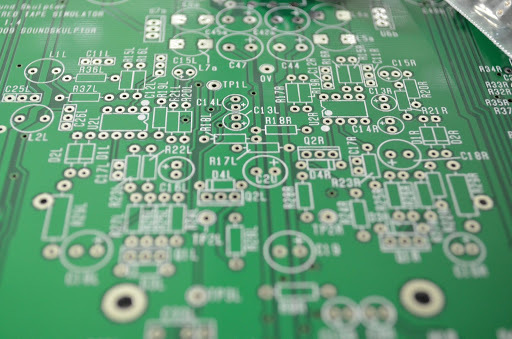 The PCBs are all clearly marked, which made it easy to identify where the components go. There are a total of 3 boards. There is the main PCB as well as the LED boards. You have to actually trim the LEDs and surface solder them to the board. They can be a little tricky at times because they can actually slide around on you while you are surface soldering them and they need to line up with the slot on the faceplate. I shouldn’t have to say this but since there are ICs involved you should ensure that static is fully discharged from your body before handling them. Now the unit is fully assembled and ready for testing. Several measurements are necessary at this point before the unit is usable. Test audio files are available for download if you do not have a signal generator. I got the 19″ rack faceplate because I wanted to mount it in my rack. 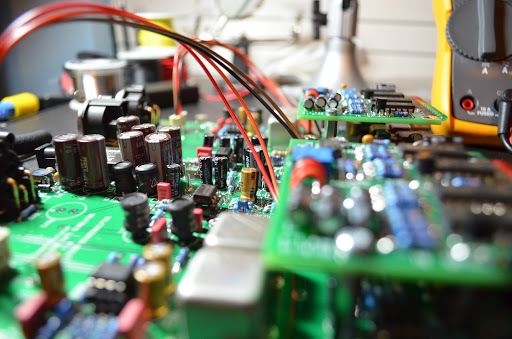 At the testing phase you need to take certain measurements to ensure you are getting proper voltages at certain points as well as calibrating the LED boards for each side. The only issue I ran in to during the build was that I was moving a bit faster than I should have and I got complacent with just one electrolytic capacitor. I put it in backward and needless to say it blew up before I had the chance to cut off the power. I got a replacement and all was well. If you don’t work on electronics all of the time you should probably expect to spend a couple of days doing the build and whatever you do don’t rush. It may take about 6 to 8 hours to assemble, test, and make ready for use. I built this thing a while back so I have been able to spend quite a bit of time with it. There really aren’t that many controls. You have an input which controls the amount of the effect as well as an output control. You have a selector switch which you can control the IPS setting from 7.5, 15, and 30. Finally you have the hardware bypass for both the left and right sides. I use this unit quite often. When I put an analog chain together I usually use this as the first device and drive it in to some of my other analog equipment. Most notably it really excels on a drum buss. I really like the 15 IPS setting with the input at about 50 percent. Drums are just the tip of the iceberg though. It sounds great on guitars as well as the entire mix buss. Obviously with a much more subtle setting on the mix buss. Even though it’s subtle you can really tell it’s doing it’s job. There is just something about sending the your signal through a tape circuit that really gives you a nice sonic character that many people seem to really like. I’ve used this device in the production of both rock and electronic music and it has worked very well for both types of music. To close, everyone that has heard the STS has been pretty impressed. I certainly have gotten my money out of it. Even beyond the way it sounds I think the side effects have been just as helpful. I have started to think about why I am not building more equipment myself. When you build equipment yourself you have much more control over it’s modification such as choosing different opamps or transformers. I have a couple of other projects on the table at the moment. I have a TLA C1 Dual Valve preamp/compressor that needs to be recapped. I am going to recap the unit as well as replace the tubes with some vintage Telefunken NOS tubes. 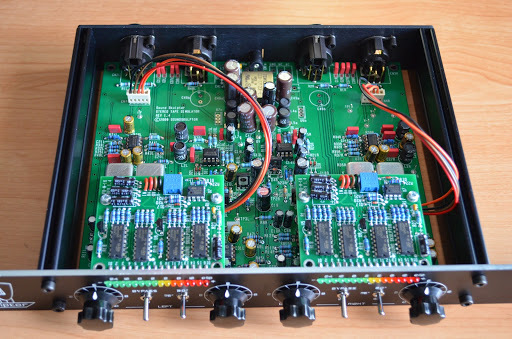 Also, I am going to build a 51x rack with some API preamp modules. 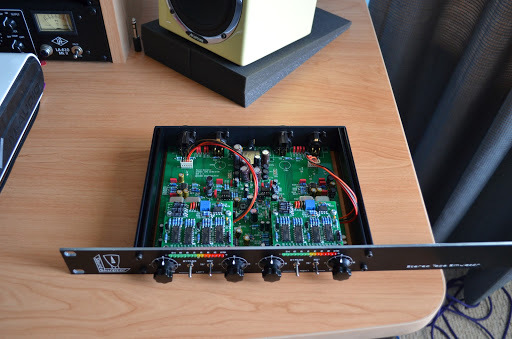 Since I am thinking about building a new studio it would be nice to have a rack of API preamps for recording drums and other instruments. A few other pictures of the STS build. Posted in sound skulptor, STS, tape.